The aim of this tutorial is to introduce TakkStrip, and how to use it. TakkStrip is an array of five sensors which were organized into a strip. The distance between the sensors is 8mm. Each strip has a dedicated microcontroller (attiny) which makes it possible to activate required sensor (i.e. chip select). Though the sensors were organized into a strip, the strip can be cut and the sensors can be used as individual units. Cutting space has been indicated between the sensors. Once a sensor been separated, side holes can be used for wiring. The hole size is 0.7mm and was designed for 30G wire. Individual sensors can be wired back to he microcontroller through the "optional wiring" connectors. Four wires are required to operate TakkStrip. It is suggested using 30G size wire, as these match the holes designed. The TakkStrip uses I2C interface for communication. 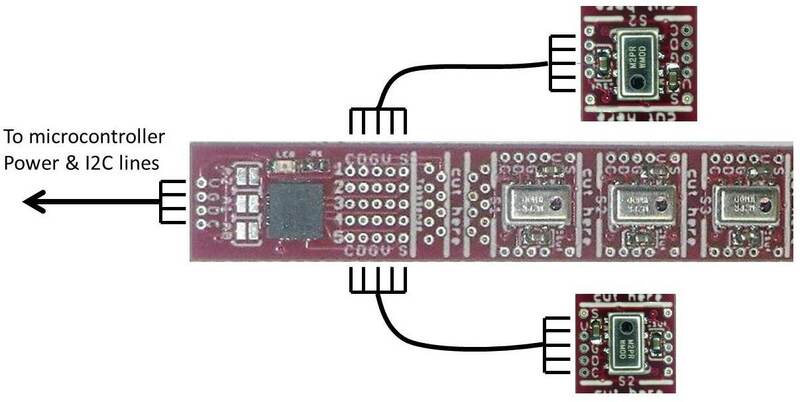 To enable fast sampling rates of the pressure sensors a custom I2C protocol was developed. This protocol leverages the addressing bits to select which sensor to sample. This way only the address command shall be sent by the I2C master over the communication lines to select or deselect a pressure sensor. The microcontroller on the strip is using 8bit addressing. The upper 4bits are used to identify the strip number, and the lower 4bits are reserved for commands. Three dedicated pins were provided on the TakkStrip to configure the four address bits. These pins are A0, A1 and A2. The address is set during the boot up of the microcontroller. Note: early versions of the TakkStrip had resolved with a less intuitive addressing pattern. The earlier pattern is archived here. Pressure sensors are selected by configuring the lower bits of the address. Even numbers are for swtching ON the sensors. Odd numbers are for switching OFF the sensors. * where x is the TakkStrip address. Switching ON the first sensor of the TakkStrip with address 6x the master will need to send 60. Switching OFF the first sensor, the mater will need to send 61.